Properties in Klosters-Serneus average 4.6 out of 5 stars. 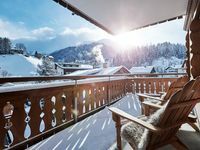 Stunning Setting and Views From This Family Chalet in renowned Klosters. Property 12: Stunning Setting and Views From This Family Chalet in renowned Klosters. Beautiful apartment in the Swiss mountains. Property 13: Beautiful apartment in the Swiss mountains. Property 17: 1 bedroom apartment in chalet with stunning view over Klosters and mountains. Family friendly wooden house for 4-5 persons in the Montafon! Perfect ski holidays! Property 34: Family friendly wooden house for 4-5 persons in the Montafon! Perfect ski holidays! Modern, well cared for vacation address. Property 35: Modern, well cared for vacation address. 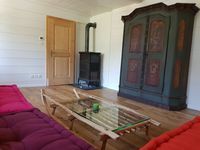 Property 41: NEW, EXCLUSIVE, COZY APARTMENT !!!! Sunny, central yet quiet south-facing hillside with stunning views! Property 45: Sunny, central yet quiet south-facing hillside with stunning views! Property 47: Immaculately well kept, with atmospheric décor. Clean, fully stocked kitchen, right near train and lift. We thoroughly loved renting this perfectly cozy and bright 2 bedroom condo located in the heart of Klosters...5 minute walk from the ski hill, grocery store, shops, and lovely walking/cross country ski trails. An absolute gem of an apartment which also had a lovely wrap around terrace providing full sun throughout the day.